Signup for the latest info on my shows and works available. For Immediate Release — Spinello Projects and Fordistas are proud to present the second installment of The Annex, an experimental, non-commercial arts space dedicated to offering a safe space for promising up-and-coming Miami-based curators and artists. Focusing on underrepresented and underserved communities, The Annex provides a platform and resources to realize thought-provoking experiences through art. RCS 51-75 Exhibit is a multimedia group show featuring participants of Rocking Chair Sessions podcasts 51-75, curated by BABA Collective. The Exhibition runs through March 29, 2019. BABA Collective is raising money to match a Community grant that was awarded from the Miami Dade Departement of Cultural Affairs for future exhibitions. Please join me for 2018 Open Studios. I will be open 11-4pm with light snacks and drinks. Various new works now available just in time for the holidays. There will be other Fountainhead artists open as well. Today we’d like to introduce you to Sri Prabha. Sri, can you briefly walk us through your story – how you started and how you got to where you are today. I immigrated to the US as a kid from India and lived in the Boston area before roaming the world. Once here, my focus on exploring our world grew and transformed into using art as a way to exploring the complexities and wonder of our natural environment. I went to several art schools, Mass Art, Cal Arts, and Cornish College of the Arts. I learned what was interesting to me in those places and further developed my work within my own perspective of being from an Eastern culture. I lived in San Francisco teaching and making work for 13 years before moving to South Florida in 2010. Moving down here I found an open atmosphere to create and experiment. I had several studios in Miami, the one at the Fountainhead was probably the most useful and productive, and I wish we had something similar in Broward. I started showing my work at The Deering Estate, Boca Raton Museum of Art, Art and Culture Center Hollywood, Moca North Miami, downtown Miami pop ups, Young at Art Museum, The Fountainhead, and the Fat Village Project Space. I received the Best Artist Award by Broward New Times in 2015, and the South Florida Cultural Consortium Award in 2016. I also have a permanent installation at the Governmental Center in downtown Fort Lauderdale installed end of 2017. The road for me has been like the game Chutes and Ladders. Better hang on and know what you want out of life! From a family perspective, being of Indian heritage, going into art was very unheard of. It’s still non-existent in our upbringing, but I learned to forge my own path and not to care too much what others thought of me early on. We only get one shot to discover and exist as we are meant to be. So let’s switch gears a bit and go into the Sri Prabha story. Tell us more about the business. I’m known for my multidisciplinary approach to art making. My work raises awareness of ecology, mindful consciousness, and our relationship to the natural world. My work manifests across a range of mediums that include installations, video, sculptural paintings, and photo based works. Additionally, I integrate into my aesthetic process, tenants of geography, nature, time, human origins, and the cosmos. I illuminate new possibilities and reconcile the old and new by synthesizing deeper understandings of our relationship to the natural world. I ask how our intellectual understandings compare with our emotional responses. I travel the world to conduct research connecting geological identities, man’s drive for scientific exploration, and humanities connection to The Universe. Asking the questions where are we going and how will we get there? Conscious and subconscious connections are visualized and expressed through art as a conduit to the interconnected cosmos. What I enjoy especially is bringing these experiences to diverse communities thru partnerships with counties, and other non-profit organizations. I also enjoy making commissioned works on different scales, such as public art or for private collectors. What really sets me apart is that I am a true fusion of Eastern and Western knowledge. My Eastern heritage informs and develops the Western Ideas in Art making and consciousness. I think about Vedic ideas about interconnectedness, and how contemporary science points to similar concepts. Old knowledge fused and supported by current science. These threads about how I make my work conceptually sets me apart from anyone else. On a recent project, a client commissioned me to make work for her law office. A glass conference room in which I made a lighted mixed media work titled Cosmic Stream. The really interesting thing about this work is that you can see it from both sides, and you see two different works. One side references large stellar bodies and the cosmos on a large scale, while the other is inspired by the microspic interactions of star formations and plate techtonics. These concepts are nature based yet abstracted in a contemporary way to engage and open a dialogue with visitors to the office. Another project I am proud of was commissed by Broward County Public Art and Design for the Governmental Center in downtown Fort Lauderdale. This project involved transforming some uninspiring corridors into something that made visitors feel welcomed and transported into nature. I shot video around Broward County parks and integrated it with light to make 3 light pillars incorporating video art and artifacts from nature. I also made an Ibis and a live oak tree LED form that look like neon for the corridors. The finished installation is a regenerative experience that will connect people back to nature and remind us of what’s in our own backyard. Another client choose works from my Anthropocene and Natural processes series. These works explore our relationship to ecology and deep time. They are a profound fusion of intellectual and emotional inquiry thru visual art. And last, but certainly not least, I am clearly very proud of The South Florida Cultural Consortium Grant I received in 2016, the largest regional, government-sponsored artists’ grant in the United States. This award was very satisfying to receive for its recognition of the quality of work I’ve done. There are lot of people behind the scenes that invest their time into growing the cultural value of South Florida and I want to thank them for their efforts and passion. Select works available on my website www.sriprabha.com and Alessandro Berni Gallery https://www.alessandrobernigallery.com/artists, and for commissions contact me directly at sri@sriprabha.com. Founded on 2012, Alessandro Berni Gallery had been hosted by OPEN SPACE FOR ARTS Art Space directed by Giancarlo Pastonchi in Perugia until 2016. From 2017 Alessandro Berni Gallery has been based in NYC. The line between chaos and organization are sometimes truly indecipherable. Being active in the art community definitely increases your chance of being noticed. That has worked for me to a point, however, that same activity goes unnoticed by others. Paraphrasing from the Bhagavad Gita, all I can say is do something if you enjoy it, and not for its rewards. Select works now available at Alessandro Berni Gallery. Following successful installments in the UK, Australia, and the US, The Other Art Fair is thrilled to make its debut in the creative heart of Chicago at Mana Contemporary Chicago on September 28-30, 2018.Presented by the world's leading online art gallery Saatchi Art, The Other Art Fair showcases work by 130 talented independent and emerging artists, each hand picked by a Selection Committee of art world experts. Slipping between resin pours, meditative states, and explorations into the cosmos through everyday objects, Sri Prabha challenges our sense of gravity and simultaneously asks us to find our center. His coalescing galaxies are fluid yet contained within their solid resin forms. Poetically, “Anthropocene 1” renders a discarded sneaker as an animalistic object with gritty toenails poking out from the geometric treaded sole. The object is captured from above as though it is a specimen of another species, a disruption in the natural order. Curated by Laura Marsh, discrete objects and poetic photographs complement the immersive. Prabha will install an encompassing meditative environment for “Nightlands 3,” an oscillating video that explores our connection to the oceans and our dependency on the water cycle. Prabha is a multidisciplinary artist originally from Hyderabad, India. He holds an M.A. in Clinical Psychology from Argosy University in San Francisco, CA and a B.A. in Studio Arts from Cornish College of the Arts, Seattle, WA. Recent shows include the Historic South Florida Survey Show 100+Degrees in the Shade and an expansive solo installation at Young at Art Museum. Prabha won a 2016 South Florida Cultural Consortium Fellowship. He is an alumnus of Hambidge Center Creative Residency Program in Georgia and the Brush Creek Foundation for the Arts Residence Program in Wyoming. His works are in private collections in Chicago, Ft Lauderdale, Seattle, San Francisco, Miami, New York, Washington, DC, and Copenhagen. The idea of the BABA COLLECTIVE was born when in discussion of the diversity of artists that were found at the BAC, and other institutions in Miami, they realized the lack of archives providing the ability to access interviews of these individuals. Thus RCS: ROCKING CHAIRS SESSIONS was created. A publicly accessible forum where one could find individual recordings describing the professions, media, and life of South Florida based creatives. Launching their collaborative endeavor in 2017, the BABA COLLECTIVE seeks to amass a window into the lives and process of SoFla based professionals in the arts. Join me as I give my perspectives on some selected works in the Norton collection. Artist Sri Prabha leads an informal, 30-minute gallery tour to offer unique perspectives on works in the Norton's collection and special exhibitions. The program was started to provide visitors with the opportunity to engage with artists whose artistic interests are reflected in the Norton's works on view. The artists were chosen for their diverse practices. They range from emerging to established, and live and work in Palm Beach, Broward, and Miami-Dade Counties. They work in a variety of mediaâ€”from sculpture and painting to installation and digital media. They exhibit their works, attend residencies and receive commissions internationally, nationally, and locally. Among them are several South Florida Cultural Consortium Fellows. The South Florida Cultural Consortium (SFCC) identifies, supports, and celebrates our regional artists, promoting the appreciation and production of the arts in South Florida. In the United States, the SFCC is the largest government-sponsored grant program for artists living in the counties of Broward, Martin, Miami-Dade, Monroe, and Palm Beach. Each year, hundreds of artists apply and this exhibition showcases the winners of this prestigious prize for the years 2014 and 2016. Celebrating the breadth of artistic production from South Florida, this exhibition presents the work of 25 individuals, who collectively embody the diverse culture of our region. Several of these artists engage with strategies of conceptual art, addressing themes about contemporary experiences such as technology and the internet, notions of migration, local and mainstream cultures, or ideas of representation. Other artists make use of traditional techniques, such as painting, drawing and sculpture, providing exquisite forms, colors and shapes in abstract compositions. Ranging from a diverse media, their works present creative voices conscious of the complex dynamics of today’s culture, as well as the desire to keep pushing the possibilities of human perception. Supporting artistic creation in a pivotal moment of an artist’s career, this exhibition celebrates the innovation and potential of these South Florida artists to continue their paths as expressive leaders of their generation. Installation views of The Light That Brings Hope. Documentation photos by Silvia Ros. For an artist who has only been in South Florida for a few years, Sri Prabha has made a stellar impact. He has created major installations outdoors on museum walls, been in several group and solo shows and won Best Visual Artist from the Broward New Times last year. His spellbinding work is unclassifiable though he uses photography, video, painting and found objects to create environments that viewers are able to project whole worlds onto. “I want my art to be inclusive, to engage everybody on their own terms,” he says in his sunny art filled home studio. A visit to his house is like being in one of his installations as video art in lightboxes swirl with colors and rotating shapes on the walls, paintings line the hallways and numerous objects – glass domes filled with bones and fossils and rock prop themselves on the coffee tables. Sri Prabha was born and lived in India for a few years before relocating to the US, earning a master’s degree in clinical psychology at Argosy University near San Francisco, where he lived before moving to Florida in 2013 with his wife. One of these curators was Jane Hart, then curator at Art and Culture Center of Hollywood who immediately gave Sri Prabha a show at the Center and another at her 100 Degrees in the Shade Gallery in Miami’s Design District where he took over a glass enclosed office in the back of the gallery. In the office he made a new installation called The Night Lands that fused four video projections with paintings and photos. 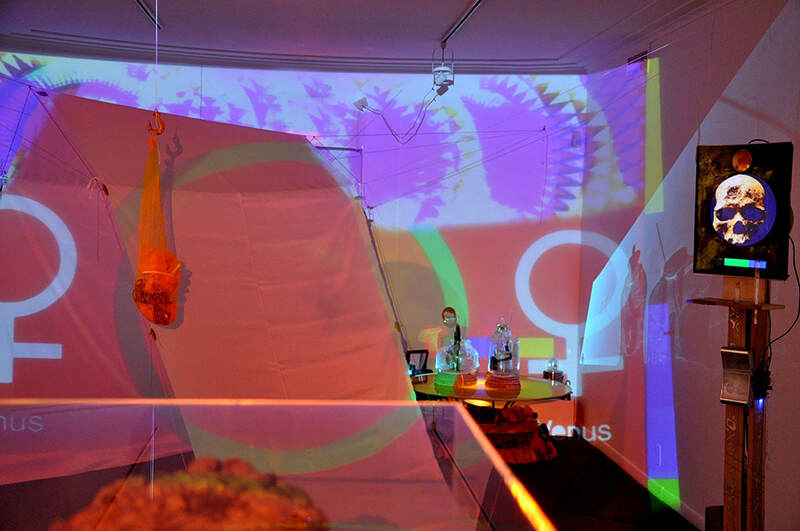 The trippy room also had sound he created, a warm throbbing hum that reverberated throughout the rest of the gallery. I ran the space as Director for four months and turned the installation on and off every day, feeling slightly hypnotized by the soundtrack and glow of the room. Gallery goers were drawn to the room and its womb like aura. His website says his art is about “Synthesizing the possibilities across ecology, geology, and science. Conscious and subconscious connections are visualized through art as a conduit to the interconnected cosmos,” but it’s really about awe and wonder and curiosity. At a recent panel at the Armory Art Center in West Palm Beach curated by Elle Schorr, Sri Prabha showed slides and videos that included some of his current inspirations. He spoke about the new worlds that are being discovered all the time, about the black holes in the galaxies that actually bend time when you go down in them. One of the video he screened was of a little lunar lander that NASA had shot into space to land on a comet and beam back info. Watching this small man made spidery thing bounce around on the surface and struggle to secure its little feet amused him to no end. After his hour long talk inside the Center, Sri Prabha surprised the group by leading us outside to a back courtyard where he had projections set up against three of the walls. When the skies opened up and a deluge of rain came down, it actually made it all more beautiful as the rain slicked palm trees and walls and even the raindrops themselves reflected the projections in a rainbow of colors. Sandra Schulman is an arts writer, music and film producer. Born in Miami, her work has appeared in Billboard, Variety, Rolling Stone, Ocean Drive, Country Music Magazine, The New York Daily News, News From Indian Country, and Entertainment Weekly. She was an entertainment columnist for the South Florida Sun-Sentinel for 8 years. She has authored three books on pop culture. She currently lives in West Palm Beach with her blue eyed whippet.Sandra Schulman’s column appears weekly. Contact her at sandraslink@gmail.com. Created by Young At Art Museum, this exhibition explores how technology and art intertwine and will feature an array of technological artwork produced by contemporary South Florida artists. Through various media, artworks and a series of other interactive actvities, visitors will learn about a broad range of technological developments and their effects on art both before and after the turn of the 21st century. Featured artists include Jessie Laino, Joe Winograd, Sri Prabha, Mattia Casalegno, Jonathan Rockford, Oliver Sanchez and Ron Erlih. Additionally, marine biologist Colin Foord and musician Jared McKay will use a unique methodology to blend science and art in a way that portrays the beauty of coral while inspiring the next generation to restore coral reefs. I will be showing new work at Art Palm Beach Jan 18- 22. 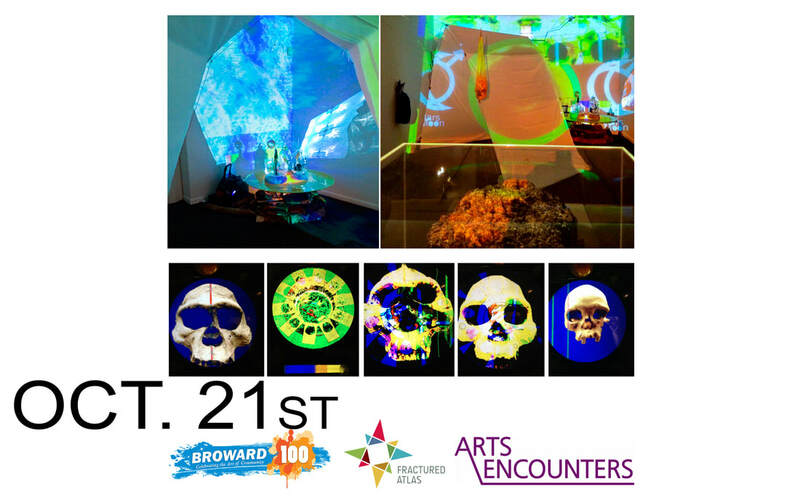 100+ Degrees in the Shade: A Survey of South Florida Art"
Created in 1985, the South Florida Cultural Consortium is an alliance of the local arts agencies of Martin, Palm Beach, Broward, Miami-Dade and Monroe counties. The Consortium’s mission is to develop cultural excellence and accessibility through collaboration among our counties. The arts agencies share strategies from the great cultural work in each of our communities and pool resources to initiate joint projects that take advantage of this collaboration. Each year, more than 300 artists who live and work throughout the five counties submit their applications for consideration to the South Florida Cultural Consortium’s Grant Program for Visual and Media Artists. The Consortium is a partnership of the local arts agencies of these five counties. Through these agencies, applications are made available to artists in the region. Submissions are grouped by County. A regional panel of visual and media art experts from South Florida is convened to provide an initial review of the submissions. The regional panel forwards its recommendations to the national panel. This national panel – with expertise in visual art, film, and media and chosen from a variety of academic and major visual arts institutions from around the country – is given the responsibility of recommending the final recipients. During a day-long deliberation, the submissions are viewed by the national panel in a series of rounds. The panelists then reduce the selection to the final group of awardees. The funding available from each county determines the number of awards presented from each county. The dynamics of the panel shape the selections from year to year. Merit is determined based on individual accomplishments as evidenced by the work submitted for review, with the highest premium placed on coherent bodies of work. The national panel’s recommendations are reviewed and ratified by the South Florida Cultural Consortium. All panelists are required to follow the conflict of interest policy established by the Miami-Dade County Department of Cultural Affairs. Career City at Dillard Elementary with Ranger Good Works Non Profit outreach. Ranger Good Works opens its arms to the community, friends, and family. Our member base consists of at-will Volunteer Professionals who dedicate their time and talent to aid and improve the quality of life for our citizens. Giving back to the community is a core value for our organization and our members. Through volunteer hours, donations, technology solutions, marketing efforts, software services, and connections, Ranger Good Works supports programs and organizations that address the needs of our local under-resourced communities throughout South Florida.The Ranger Good Works initiative was designed to meet the needs of our employees, friends, family and each of our interest in helping and making a difference in the community we live in. We all feel good when we know we have changed a person’s life for the better. A trippy journey to the cosmos is what viewers can experience when exploring one of Sri Prabha's mixed-media installations. The Indian-born, Seattle Cornish College of the Arts educated artist, knows how to playfully introduce scientific discoveries into art making. His works, nearly fantastical in nature, explore his deepest thoughts and questions about the nature of humanity. He integrates subjects often not seen around the South Florida art-sphere, such as geology, nature, time, and human origins, into his work. A walk around his large-scale installations features a dash of sensory overload through his use of experimental sounds and abstract video projections juxtaposed with sculpture, paintings, and prints. Onlookers can take it all in, in a meditative state as the artist intended, or stargaze while enjoying a geological time exploration before heading off into another orbit. Broward resident Sri Prabha, a major installation mixed-media artist who was named New Times Best Visual Artist 2015, is showing new work called The Night Lands, featuring other-worldly video projections and actual geological samples such as optical calcite, volcanic rock from craters of the moon, and fossils he collected during a summer artist residency at Brush Creek Foundation for the Arts in Wyoming. "If you take someone and put them on a different planet — we are 50 years away from manned expeditions on Mars; it's not too far away — you realize it equalizes our ethnographic differences," Prabha says. "The Night Lands looks at geology, time, consciousness, and how they all interplay in our daily lives. The idea is to feel like you are on an archaeological survey on some planet somewhere." 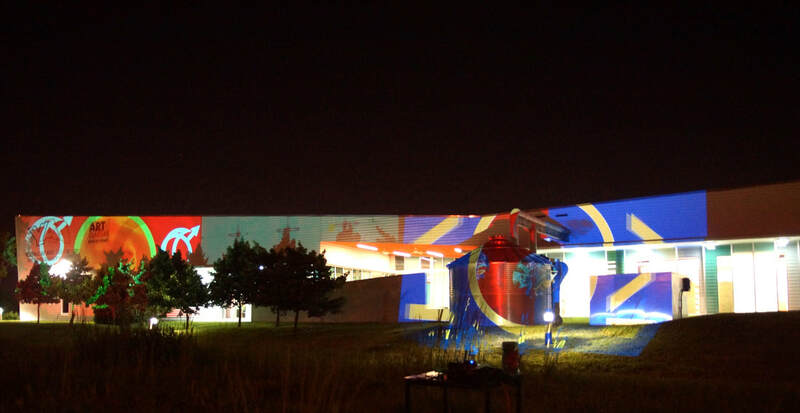 His installation will be shown at 3900 N. Miami Ave., in Miami's Design District. Inclusion in the 2015 International Photo Review Competition Issue. I'll be away July for an awesome artist residency at Brush Creek Foundation for the Arts. 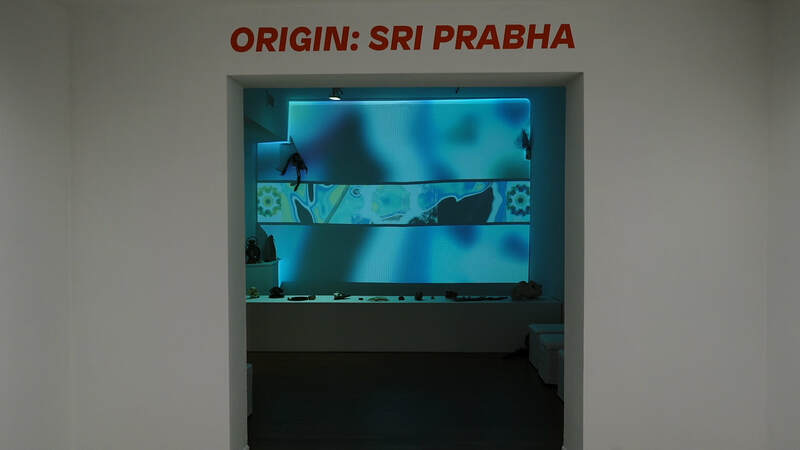 At Young at Art Museum in Davie, artist Sri Prabha has turned one gallery into a crystal-filled grotto where video art collides with science and spiritual meditation. Light from nine video projectors dances and shimmers on the walls and ceiling, which are encrusted with crystal stalactites (not real, but painted Styrofoam) that stick out at 45-degree angles. On nearby pedestals are personal belongings such as metal cups and lockets covered in more crystal (real), which Prabha creates by dipping the objects in a solution of potassium aluminum sulfate. Images of mandalalike kaleidoscopes twist and jump around the room, as does video footage of solar flares, tides, crystal formations, trees and star clusters. "It's like making an awesome curry, a huge beautiful medley. It's controlled chaos," Prabha, 45, says during a walkthrough of his new "Orbiting Cathedrals" exhibition, stopping to admire the color patterns. Starting Friday, Jan. 30, four rooms in the museum will house the Hollywood artist's otherworldly video-projected art, where Prabha says visions of outer space can collide with spirituality and the unconscious mind. "I don't want to be so conceited and say this is a place of enlightenment, obviously, but you can let your senses go and your consciousness expand in here," Prabha says. "In the old days, we went to cathedrals to find enlightenment. I figure these rooms will let us reflect on our own humanity. In a way, I feel like all my video art is like a Rorschach test, because what you see is unique to you." Prabha collected a master's degree in clinical psychology at Argosy University near San Francisco, where he lived before moving to Hollywood in 2013 with his wife. He cites Bill Viola's experimental videos and David Lynch's eerie, "Eraserhead"-era films as inspiration for his video art. Though he no longer practices Hinduism, Prabha is fascinated with Hindu meditation principles learned in his hometown of Hyderabad, India. "I'm more of an agnostic now. I do it for myself. But I also want to honor Jung's theories about the deep unconsciousness," says Prabha, who earned his undergraduate degree in video art at Cornish College for the Arts in Seattle and taught graphic design until 2005. This is why science and spirituality, he says, tend to intertwine often in his video animations, created using five graphic-design software programs. Visitors who duck through a crawlspace carved into the crystal room, for example, will emerge into a room filled with a slowly rotating International Space Station, coral reefs and schools of sea bass darting along the walls, set to Claude Debussy's "La Mer." To Zach Spechler, who operates Young at Art's in-house art collective Bedlam Lorenz Assembly, the rooms are "places where Mother Nature is taking over." "These crystal structures take over our personal belongings and turn it into a time capsule for the future," Spechler says. In January, prolific and emerging man-of-the-hour Sri Prabha will give a solo show at the museum. His "Orbiting Cathedrals" includes beautiful, science-meets-art, dreamy animation projections, sculptures, and installations. Spechler says that with "the new Pérez Art Museum Miami (PAMM) and all the great collectors in Miami, it's a very important time right now for Broward to find its own personal identity. With Art Basel becoming bigger and bigger... it's actually become one of the more important fairs in the world. Art Basel's presence is starting to project a yearlong vibe throughout South Florida that we can benefit from. In the past, Miami and Wynwood were happening in just December and only people in the art world knew about the art events year-round, but now that's changed. Miami is almost supersaturated, and Broward is local enough to create its own identity." Sri Prabha will illuminate the multifaceted ideas and influences that inspired Outpost, his site-specific installation at the Art and Culture Center of Hollywood. Planetarium AstroJam! is a special evening of live music, animation, improvisational dome projections and wonder. 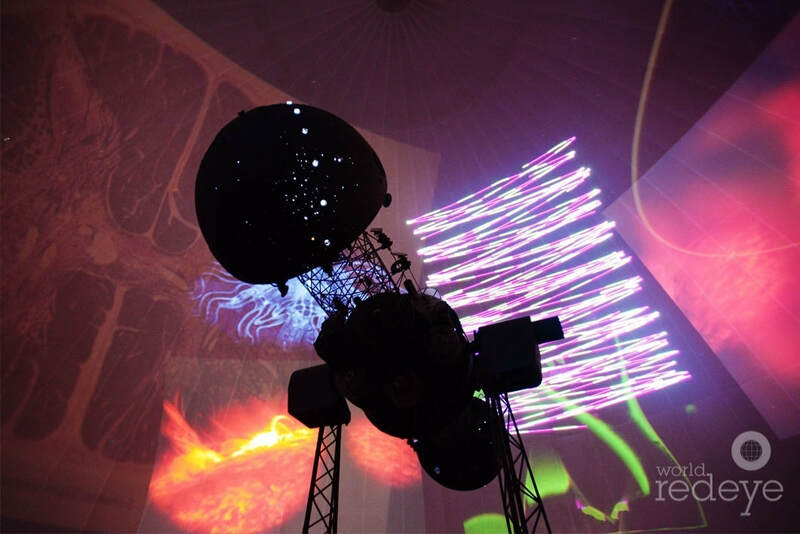 A stellar collision of science with visual, sonic & media arts under the historic Planetarium dome! Miami, FL – October 10, 2014 - The Patricia and Phillip Frost Museum of Science continued its Astronomy Day: Stargazing into the Future celebration on Friday with Planetarium AstroJam!, a stellar collision of science with visual, sonic and media arts under the historic Planetarium dome. In partnership with the Borscht Film Festival, the event began with the Miami premiere of filmmaker Bernardo Britto’s animated short film, “Yearbook,” a 2014 Sundance Grand Jury Prize for Animation. This six-minute film follows the story of a man hired to compile the definitive history of human existence before the impending demise of the planet. Following the film, Caroline Simpson, Ph.D., associate professor at Florida International University, gave a brief talk on exoplanets research. Guests then had the chance to observe the night sky on the Museum’s rooftop observatory before heading into the Planetarium to enjoy live music provided by local musicians Rob Goyanes and Brad Lovett, who specialize in combining punk, electronica, and rhythm into unique and fresh soundscapes. The music was accompanied by live improvisational dome projections provided by Miami artists Sri Prabha and Nayib Estefan, who synthesize science and engineering and the senses into art. The evening featured delicious libations courtesy of Reyka Vodka, Monkey Shoulder and Biscayne Bay Brewing Company. Mixed media and multi projectors. Dimensions Variable.2014 At Haptic Colors, Fatvillage Projects Contemporary Art Space. Haptic Colors at Fatvillage Projects Contemporary Art Space. Haptic Colors is a group exhibition of artists who are using color in space to transcend the 2-dimensional picture plane. The five installations and two videos that are on view are non-representational, and necessitate physical proximity to the work to fully experience the optical and visually tactile malleabilities of each piece. Reservations are required. RSVP to Collette Spence-Wilson at cswilson@moafl.org or (954) 262-0221. May 23rd Cosmic Whirl Video Installation. Falarara and Prabha Projects Mixed media installation in the vault by Sri Prabha and Charles Falarara. "Untitled" dimensions variable,mixed media, and single channel video projection,2014. Lobby projections by Sri Prabha. Noise Reduction Experiment #2 Installation ,Multiple projectors,mixed media,dimensions variable,2014. February 2014. Ingraham Building,Miami Fl. 6th All-Media Juried Biennial at The Hollywood Art and Culture Center. The All-Media Juried Biennial includes paintings, drawings, prints, sculpture, photography, video, computer-generated images, site-specific installations, and performance art from Florida-based artists. This year’s jurors are Hunter Braithwaite, Miami Rail editor, and Gean Moreno, founder of [NAME] Publications, critic, curator, and artist. 11 artist designed fully-playable miniature golf courses. Designed by artists from across the United States, Big Art: Miniature Golf is a unique exhibition that explores the fusion between art, design and play. The mini golf hole mixed media installation, “Golf in the Swamp With John Muir” is inspired by the intrepid and fabled explorer, John Muir. In 1867, he traveled into various swamplands in Florida and discovered amazing sights. We were enchanted by the discoveries he made and have recreated a small snapshot of those wonders in a playful setting for all to enjoy. Exotic flora and fauna along with the iconic Florida alligator in the swamplands set the stage for an amusing interplay of fun and history. Water ballast and invasive species issues. Dr. Palmer head of SESYNC coordinated a visit with Dr. Tamburri from MERC, The Maritime Environmental Resource Center. The discussion was entitled ACT/MERC Fluorometry for Ballast Water Compliance Monitoring Workshop. (ACT is Alliance for Coastal Technologies.) trying to find the best ways and methods to limit invasive organisms that hitch a ride in the ballast of giant cargo ships from around the world.